In the U.S. and many other nations, it’s no longer unusual for women to have a first child at age 35 or even 40. In Canada, this rise in births to older mothers has produced a striking turnabout: For the first time on record, birth rates are higher for women in their late 30s than in their early 20s. According to a new report by Statistics Canada, the switch happened in 2010 and widened in 2011, when there were 52.3 babies born per 1,000 women ages 35 to 39 and 45.7 per 1,000 women ages 20 to 24. The agency also reports that birth rates for women in their early 40s now are nearly as high as for teens. 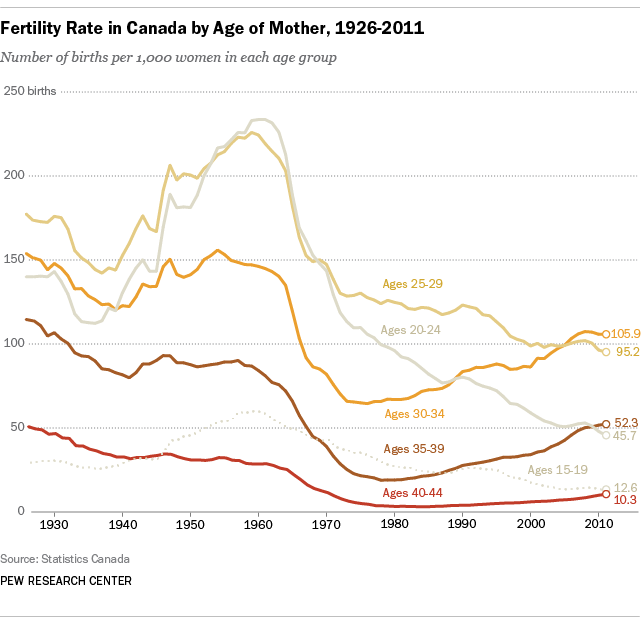 This turnabout results from four decades of generally rising birth rates among Canadian women ages 30 and older, and falling birth rates among those younger than 30. In 2011, slightly more than half of all Canadian births (52%) were to women ages 30 and older, up from a quarter (24%) in 1981. The age of first-time motherhood has been rising—in 2011, the average first-time Canadian mother was 28.5 years old. This trend has taken hold as other markers of adulthood also have been delayed: Women (and men) have taken longer to complete their education, establish themselves at work, achieve financial independence from their parents and get married. Improved birth control methods also have enabled women to postpone motherhood. In the U.S., there has been a similar pattern of rising births to older mothers and falling births to younger ones, but the change hasn’t been as dramatic as in Canada. A key reason is that birth rates among younger women are quite a bit higher in the U.S. than in Canada—more than twice as high among teens and nearly twice as high among women in their early 20s. By way of comparison, U.S. first-time mothers were on average 25.6 years old in 2011, nearly three years younger than in Canada. Although the birth rate for women in their early 20s has declined, it remains well above the generally rising rate for women in their late 30s. And only about 40% of 2011 births were to women ages 30 and older, not a majority.